Just sending a newsletter for the sake of meeting your weekly or monthly requirement is not effective. Your newsletter is a valuable marketing resource, and it’s time for you to start writing them as such. In order to create a successful email marketing campaign, it’s crucial to know the tricks of the trade. Getting people to notice your emails, open your emails, click on the stuff in your emails, and respond to your emails is tricky. Here are 13 tips and strategies that you should be using with your newsletters. Let’s take a step back for a minute. For you to get conversions in the first place, you need to have an active list of email subscribers. The best way to do this is to give them a great reason to opt in. Just saying “sign up for our newsletter” isn’t appealing. Customers who sign up for their newsletter will get 25% off their orders. It’s a no-brainer for customers to opt in. But the value doesn’t stop there. They continue by saying their newsletter subscribers also get access to exclusive offers. This implies they’ll get other discounts in the future as well. Besides monetary discounts, think about other ways your company can add value to prospective newsletter subscribers. It depends on your company and your industry, but try to get creative here. For example, an airline could offer priority boarding to customers who subscribe to their newsletter. You could provide free online seminars or e-book downloads to anyone who signs up for your newsletter. If your company hosts events, you can offer free parking passes or free entry to subscribers. Just think outside the box. The more people subscribe, the greater your conversions will be. What do you want your newsletter to accomplish? This should be the first question you ask yourself before you start writing. If you don’t know the answer to this, how will your subscribers know what to do? There are tons of other goals your company might have. But if you’re struggling, use these to get started in the right direction. Pick one and go with it. Trying to jam all these into one message is complicated and will confuse your audience. The goal of this newsletter is clearly to increase clicks to improve their engagement rates. 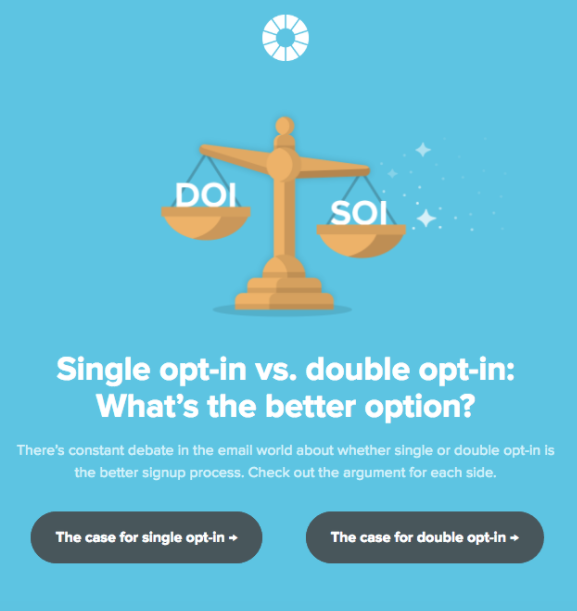 Rather than just writing a lengthy article about the pros and cons of single vs. double opt-in landing pages, they give their subscribers an option. They’ll get different content based on which CTA button gets clicked. You can use a similar strategy in your newsletter, even if you don’t want to be as direct. First, introduce your goal with the headline or opening statements. Then, discuss it in greater detail throughout the message by mentioning it once or twice. Finally, end with a strong call to action like in the example above. Emphasize it. Don’t make it ambiguous. The customer should have a clear direction of what action to take after reading your newsletter. You can’t get conversions from your email newsletter if nobody opens it. Your subject line can make or break the success of this marketing campaign. Once you understand how to increase open rates with different subject lines, you’ll have a better chance of getting high conversions from your newsletters. As you can see, the subject line can determine whether or not the message gets opened or reported as spam. How can you entice people to open your newsletter? For starters, make sure your subject lines are not boring. Subject lines such as “March Newsletter” don’t give anyone a reason to open their emails. Be personal: 82% of marketers report that personalized subject lines lead to increased open rates. Furthermore, 75% of experts say personalized messages drive higher click-through rates. One of the most common ways to personalize a subject line is by using the recipient’s name. Another enticing way to encourage opens for your newsletter is a time-sensitive subject line. Come up with a way to create a sense of urgency. There’s valuable information in your newsletter that needs to be read right away. Breaking news is something your subscribers would want to hear immediately. I’ve found that addressing a common issue or concern also works well. You’ll want to make it so that readers are so intrigued by the subject line that they can’t resist opening your email. Use these terms when you’re coming up with the subject line for your newsletter. Here’s something else I do to save time and effort and increase effectiveness of my email campaigns: I use or repurpose my blog article titles as my email subject lines. When people subscribe to your newsletter, they expect to hear from you on a regular basis. Make sure you deliver the newsletter to your subscribers as promised. 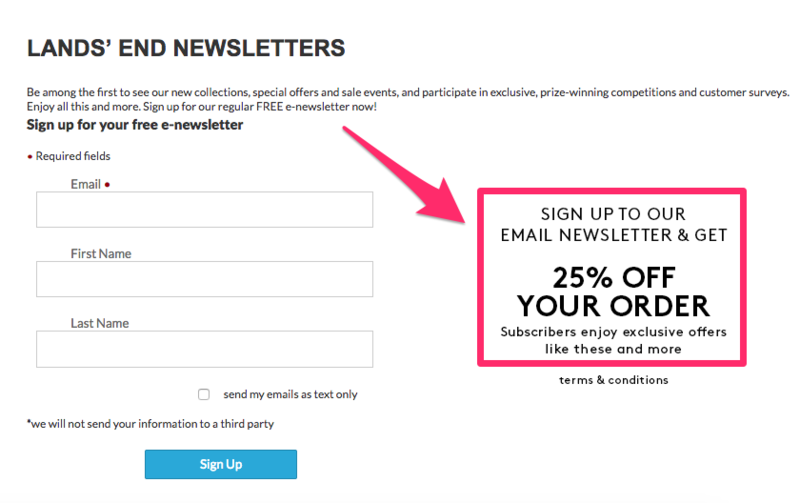 If they signed up for a weekly newsletter, you’d better send them a newsletter once per week. If they signed up for a monthly newsletter, sending them an email three times per year isn’t delivering on your promise. Slacking off on your consistency will damage the reputation of your brand. Your subscribers won’t be interested in converting because your credibility is lost. Conversely, people won’t be happy if they are expecting a monthly newsletter but instead get emails from you three times per week. This is annoying and could cause them to unsubscribe or report you as a spammer. Getting too many emails is at the top of this list. I see this happen to companies all the time. Just because a person gave you permission to send them emails doesn’t mean you can take advantage of that privilege. As you just saw from the research above, people also unsubscribe from emails if they think the content is irrelevant. It’s important for you to stay on brand and on topic at all times. For example, let’s say you’ve got a company that manufactures various home goods like couches, coffee tables, and lamps. You shouldn’t be talking about the local weather, politics, or recent sporting events. It’s irrelevant to your brand, and it’s not what your subscribers want to hear about. Also, it’s a pretty good idea, in general, to stay away from controversial topics in your newsletter. I’m referring to things like religion, politics, race, and things of that nature, unless, of course, your business is in one of those spaces. As you can see, the retail industry leads the way in this category. So if your company is in the entertainment, travel, media, or non-profit sectors, you may want to reassess the topics of your newsletters. One way to make sure you deliver the most relevant content is by letting your subscribers choose what they want to hear about. They can also decide how often they want to hear from you. By default, new subscribers receive all emails. But if they want to hear from this brand only once a month, they can unselect the Weekly Digests option. These subscribers can even decide what type of content they want to hear about. People who want to get newsletters about music and audio may not be interested in code or web design topics. If you employ this strategy, you won’t have to worry about your subscribers thinking your content is irrelevant. This creates more work for you because you’ll have to write multiple newsletters each week and month. But it’s worth it because your conversion rates will be much higher for each campaign. If you’ve been reading my blogs for a while, you know how much I love using images and videos to explain concepts. While your newsletter isn’t a blog, you can still use the same strategy. You need to understand not everyone will read every word of your content. The average subscriber only spends 51 seconds reading a newsletter. Furthermore, people only read about 20% of the text on a page. If you want your message to resonate with your audience, include visuals. Pictures and infographics make it easy for people to scan through your content. In addition, try to use videos in your newsletters as often as you can. Emails that include videos have 96.38% higher click through rate and 5.6% higher open rates. Even if they aren’t reading every word, they can still get a general sense of your message. This relates back to the notion of sticking with a common goal throughout your newsletter. People are visual learners. Using images and videos can help people process and retain information better. Don’t be afraid to add these elements to your newsletter. Plus, visuals will make your message look a lot more organized. Nobody wants to read giant blocks of text. The only way to find out whether your newsletter is converting is to take the time to actually measure that. Whatever email marketing software you’re using should have these analytics tools built directly into the platform. Take advantage of them to see how you’re doing. Identify which types of newsletters had the highest conversions. Continue using the same strategies. If some of your newsletters had terrible conversion rates, you need to understand what went wrong. Did you not have a clear goal? Was the content irrelevant? Once you figure out why your newsletters aren’t converting, it will be easier for you to make the necessary changes. But you can do this only if you’re actively tracking the results of each campaign. As we discussed earlier, people don’t dedicate lots of time to reading the text and reviewing newsletters. You’ve got to come up with ways to keep your audience engaged. Once you hook your audience with a captivating story, they’ll continue reading it to find out what happens. What story should you tell? You can tell your story or a story about your company. Again, just make sure it’s relevant. Don’t be boring. It’s also an effective strategy for B2B marketers. Not all your newsletters should be a story, but it’s definitely a good idea to throw some into the mix from time to time. Your email newsletters are an effective way to communicate and market to your subscribers. If you write them correctly, you’ll see higher conversion rates. But you need to get people to opt in to your newsletter in the first place. Give them a reason to sign up. Before you start writing, make sure you have a clear goal in mind. End the message with a strong call to action reflecting your goal. Don’t rush when you’re creating a subject line. Use words and phrases that are personalized and create urgency to increase your open rates. Be consistent and deliver relevant content. Let your subscribers decide how often they want to hear from you and what topics they want to read about. Use visuals and storytelling tactics to increase your conversions as well. Make sure you measure the results of each newsletter to see if it was successful. If you follow these tips, you’ll notice a drastic difference in your newsletter conversion rates. Here is a bonus infographic that breaks down the anatomy of an optimal marketing email for your viewing pleasure.